I am going to cut to the chase because all Achuthan and Banerji did in that piece is blow smoke without addressing the critical issue. Here is the key paragraph. It’s true enough, based on the four decades of publicly available data, that WLI growth has never dropped this far without a recession. What most don’t know – apart from the fact that the WLI growth rate shouldn’t be used to predict recessions in the first place – is that, based on two additional decades of data not available to the general public, there are a couple of occasions (in 1951 and 1966) when WLI growth fell well below current readings, but no recessions resulted. Lakshman Achuthan chastised Rosenberg in the above article (but not by name) for doing exactly what the ECRI did: Propose the WLI can be used to predict recessions. 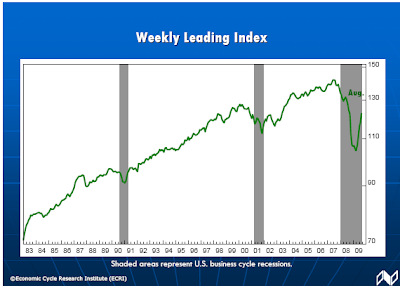 I documented proof of that in ECRI Weekly Leading Indicators at Negative 9.8; Has the ECRI Blown Yet Another Recession Call? If the ECRI does not want people assuming the WLI can be used as a recession forecast, then perhaps they ought not present it that way. "This is an index that’s been around for over a quarter of a century, and over that time (shown here) it has correctly predicted every recession and recovery in real-time." I need to repeat that, over this entire time period, I was present to see each of the correct recession and recoveries calls in real-time, without false signals in between. Please read the preceeding two paragraphs in italics slowly and carefully. Lakshman Achuthan and Anirvan Banerji defense of the ECRI is that the WLI cannot be used to predict recession, yet in a blatant attempt to promote the WLI, the ECRI did just that! Regarding today’s negative growth rate index “Let’s not sugarcoat it, it’s a sharp drop,” says ECRI managing director, Lakshman Achuthan.